Having healthy joints is critical to enjoying all that life has to offer. The more than 50 million Americans with joint discomfort will tell you that even regular activity can become difficult when joint tissues start to break down due to age, injury, and even regular physical activity. When joint tissues such as cartilage begin to break down faster than they can be rebuilt, it can result in inflammation, pain, swelling, and ultimately in joint problems such as osteoarthritis. The inflammation associated with tissue degradation causes pain and swelling, and may actually speed the breakdown process. Providing the nutrients needed to build cartilage and minimize inflammation can be beneficial in combating this health concern. 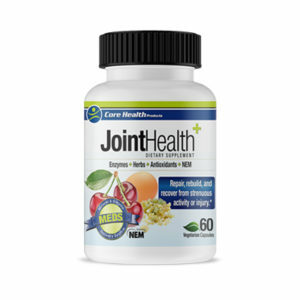 Core Health Products’ Joint Health formula is a superior formulation that combines NEM® egg shell membrane with a proprietary blend of anti-inflammatory enzymes and an exclusive blend of antioxidant herbs and nutrients. These unique ingredients combine to support healthy cartilage formation, minimize cartilage degradation, and support the body’s natural healing processes. This patented, natural egg shell membrane (NEM®) is a natural source of chondroitin sulfate, hyaluronic acid, collagen, and other glycosaminoglycans essential for healthy joints. Unlike glucosamine, which can take up to 60 days to produce an effect, NEM® has been clinically proven to provide relief in just 7-10 days. These superior, clinically proven results are what lead Core Health Products’ scientists to feature this ingredient as a core part of the Joint Health formula. Protease enzymes support the natural healing processes and efficiency of the body in rebuilding damaged areas. Core Health Products’ Proprietary Enzyme blend includes a combination of protease enzymes, with two different proteases and bromelain. Bromelain is a special combination of protease enzymes derived from pineapple that has been shown to modulate the chemical messengers of the immune system associated with pain and inflammation. This advanced combination of enzymes provides anti-inflammatory benefits and helps improve recovery from exercise. Grape seed extract, resveratrol, and quercetin are well-known antioxidants that have been researched for their benefits in modulating the body’s inflammatory processes, promoting recovery, and providing anti-aging benefits. Joint Health’s Proprietary Antioxidant Blend also includes an SOD precursor system made up of patented amino acid chelated copper, zinc, and manganese. These minerals are the building blocks your body requires to make more of its own super antioxidant enzyme – SOD (Super Oxide Dismutase). Vitamin C is critical for building and rebuilding cartilage, yet this critical nutrient is often low in the average diet. To ensure the body has all the building blocks for healthy joints, this blend includes a natural source of vitamin C (acerola cherry & rosehips) providing 200% of the daily value for vitamin C. Joint Health’s exclusive combination of potent antioxidant ingredients is combined with the powerful anti-inflammatory herb, Bowellia. This well-researched herb nutritionally supports the body’s healing processes and aids in recovery. These powerful ingredients also support the immune system’s natural anti-inflammatory processes. Every Core Health Products’ formula includes our proprietary nutrient delivery system known as M.E.D.S.™ This proprietary system uses the power of enzymes and fully-utilizable micronutrients to deliver maximum results. The exceptional combination of ingredients in Core Health Products’ Joint Health helps to maintain healthy joints, promote faster recovery from exercise and competition, and optimize the body’s anti-inflammatory processes.